This is part 3 of a 3 part blog on cloud based daylight simulations and is a review for the daylight and energy tool – Sefaira. (Read Part 1 and Part 2).We have been using Sefaira for some time now and think that it’s a great tool for doing early design and quick simulations. 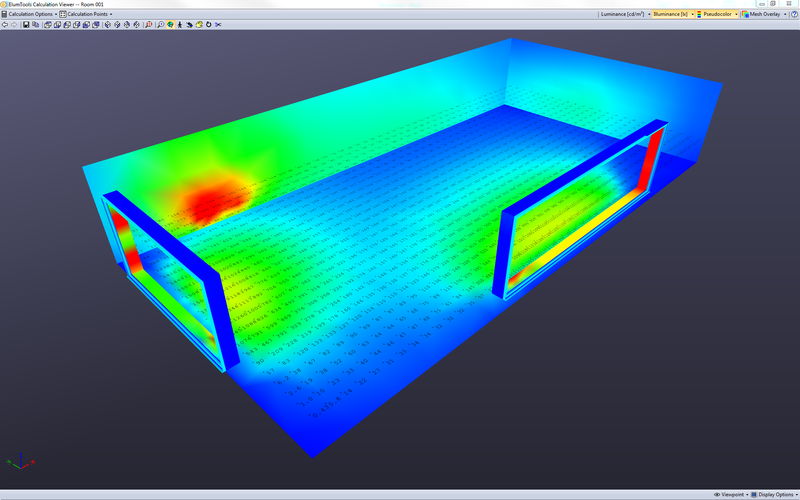 The biggest advantage of Sefaira over Lightstanza is that Sefaira can do both energy as well as daylight simulations within the same piece of software. In a previous post, I wrote about the energy analysis capabilities of Sefaira, so I’ll not go over that again. As I mentioned in that post, Sefaira was designed with integrated design in mind. That is applicable for the daylight analysis part of the software too. Sefaira on installation, installs a plug-in for both Sketchup and Revit (including 2016). Having the Revit capability is great as we at LMN use Revit as our main software for architectural documentation. Sefaira can simulate the model from either software for various metrics: Point –in time illuminance, Annual (DA), overlit and underlit areas, daylight factor and direct sunlight. Unlike Lightstanza however, these are not simultaneous, but can be viewed one at a time. However, the speed of the simulation is fast and therefore all simulation can be performed and viewed quickly. The plug-in reads the model from Sketchup or Revit and is able to detect and upload any changes very quickly to the cloud and update the analysis, which is helpful. The workflow in Sketchup and Revit is different by just one step. Since the way models are built in Revit is different, there is an extra window that creates “Sefaira Views” in the Revit Model. It essentially filters out everything except the walls, floors, roofs, ceilings, curtain glazing, glazing mullions, windows and doors. These are the elements that Sefaira (as of now) can read. They are working on expanding the number of elements that can be recognized, but it might take some time. For any other element that might affect the daylight levels, a temporary shading element has to be manually created in place. There is an option of “Ignore for Sefaira” or “Shading for Sefaira” in the element properties in Revit (and Sketchup) that lets you mark context and any other surfaces or elements that act as shading. The ignore option lets you ignore certain elements so that they won’t be used in the analysis which is helpful to filter out and simplify the model further. Different Sefaira views on the left, elements highlighted as per type and “Ignore” or “shading” for Sefaira on the bottom right. There is an option to change the ambient bounces that are used for daylight simulations. The choices are 2, 3 or 4 which is great to do a quick draft analysis or run a relatively higher accuracy model but the time for simulations is affected accordingly. The analysis are performed at a work plane height which can be changed in the main daylight visualization window. The grid spacing on the floor is dependent on the floor area and cannot be changed by the user. The simulations are performed with certain assumptions that can be read here. Changes like simulation parameters (AB), geometry etc. can be done at any point in time during the analysis. In other words, once you open a model and the Sefaira daylighting plug-in (after generating Sefaira views in Revit), Sefaira is constantly monitoring the model. Below are all the results that Sefaiara generated for a 2 floor shoebox I used for testing. The Daylighting Visualization window displays by default only the daylight results (colored floor test meshes only and not any building geometry) which keep getting updated as soon as it detects any change in the model. There is an option of viewing these result grids with various elements like walls, floors etc. which helps to understand the results better. This is helpful to view results for example a single floor with partitions. However, in a complicated model or a model with multiple internal partitions, the view can be quite confusing at times. The views of the results are co-related to the Sketchup or revit display. The daylight analysis results can be viewed in a few different ways by choosing from 3 different color schemes, or options of displaying the grid as a continuous, grid or contour. All these options are helpful for different reasons like understanding the exact levels of daylight at different spots of the floor. All results can be downloaded either as a snapshot of the daylight visualization window or as plan view of each isolated floor. Sefaira’s interface and specially the ‘almost’ real time analysis interface can be really helpful. However, we did face problems in getting the revit models to correctly being read by Sefaira. The reason behind this is the complexity of the model once it is migrated from Rhino to Revit or the way a model is developed in Revit. However, if things work as they are supposed to work, one can very quickly do multiple simulations in a matter of very short time frame to understand how different design changes will be affect the daylight in the space. It takes less than 30 seconds to simulate a shoebox on either ambient bounce setting. A larger model takes anywhere from about a minute to several minutes to generate results depending on the complexity of the model and number of floors being studied. Comparing these two cloud based tools, both stand out with their own uniqueness. Lightstanza is great as it can simulate almost any model and simulate it online (without anything running on the local machine). It makes collaboration very easy as anyone can upload a model and the results can be viewed from any machine. It also lets the user make various variation in the model using layers and can simultaneously simulate all of these options. (Read the previous post). Sefaira on the other hand can be very useful and handy when trying to iterate over a design. Since it detects the changes in the model automatically, there is no need to upload the model or setting up materials and different simulations. There are limitations to both programs like Sefaira not being able to read a revit model or Lightstanza only available for Sketchup. But then these are new tools and with time these limitations will hopefully be taken care of.